Vacations are usually shared with families and friends and filled with memories. Staying at hotels can make members feel cramped and cranky. 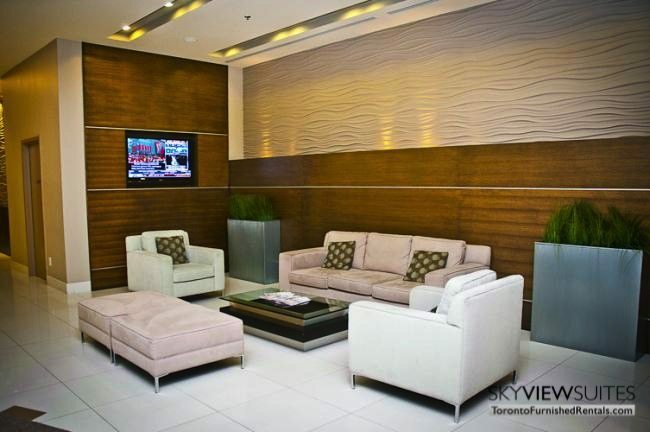 It is better to rent Toronto long stay apartments like this 2 bedroom unit at the Pinnacle. 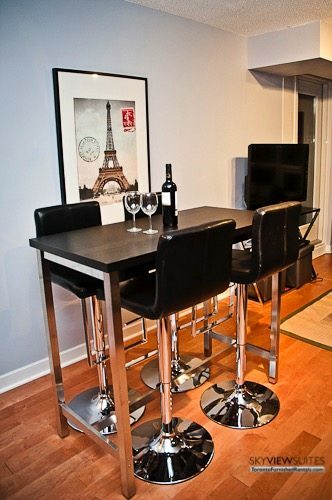 Our fully furnished unit is luxurious in both finishes and features. 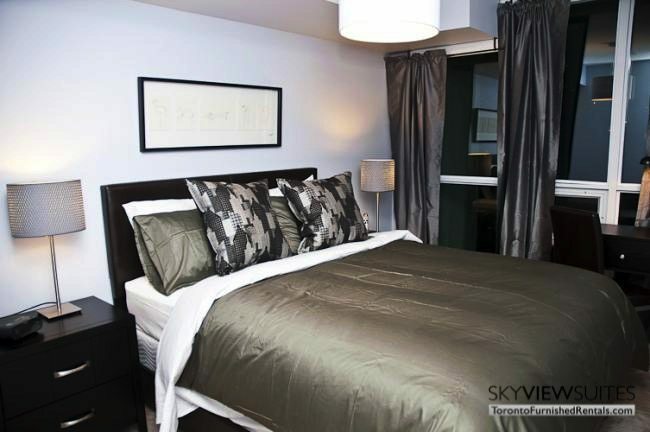 The suite boasts floor to ceiling windows, and an open concept layout. The kitchen has a beautiful glass tiled backsplash, stainless steel appliances, granite countertops and so much storage space. Everything you may ever need on a daily basis is supplied for the duration of your stay, plates, cups, knives, etc. There is a dining room table which can seat four, and a comfortable living room with a huge couch, club chairs and a flat screen TV. There are two carpeted bedrooms with a queen sized bed and fine linens on each, a walk in closet in the master bedroom. In both rooms there is a desk which can be used for work, studying or even turned into a make-up station. Deliberately for this reason, there are two full spa-like bathrooms with high-end finishes like granite countertops and under mounted sinks. They have luxurious towels that are washed biweekly with the sheets by our cleaning service. Staying at a Toronto serviced apartment means that you get access to the wonderful amenities in this building. These include a lap pool, and 2 whirlpools which you can swim in whenever you feel like going for a dip. Moreover, there is also a sauna and steam room for extra heat induced relaxation. If you want to work out there is a fitness center filled with all sorts of machines, squash courts, a putting green and a running track. For the duration of your stay, you get to enjoy the cable TV, and free wireless internet. You also have your own washer and dryer inside the unit so you can save on laundry costs. There is free parking too! 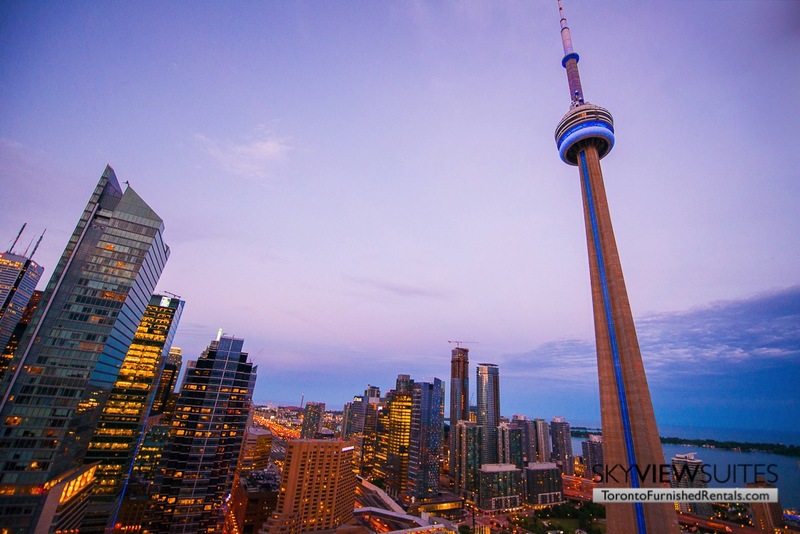 The Pinnacle Center Success Tower is located at 18 Harbour Street is only minutes away from Toronto’s financial core. Additionally, there is access to the TTC and GO Transit at Union Station.